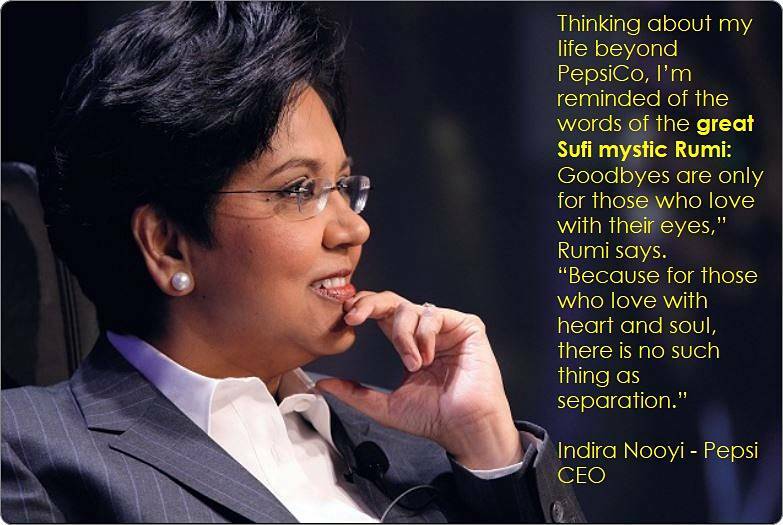 Indira Nooyi retired from Pepsi yesterday sharing a beautiful quote by Maulana Rumi. “…serving as your CEO has been the honor of a lifetime. Now it’s on to the next adventure—for us all. Goodbyes are only for those who love with their eyes,” Rumi says. When Rumi said farewell to this world, his funerals had followers of Christianity and Judaism. With his beautiful message of love, it is no surprise that Rumi’s influence has only grown over time as his quotes remain inspiration for millions today, from those starting their marital life, to CEO of Fortune 500 companies.